As I’m writing this, D is singing, well alternating between singing and humming. It’s monotonous but nice, a sign that she’s relaxed. The song on repeat is “Chim Chiminee” (I may have misspelt that) from Mary Poppins, a tune they were singing at Theatre Club today. D’s memory for tunes and lyrics is amazing, I have to remind her every morning to (for example) put deodarant on, have a wee etc but tunes etc really stick. 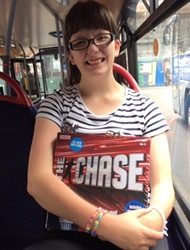 Another example is we can be watching The Chase (she has a bit of a thing for Bradders) and I’ll usually be doing a few things at the same time but she’ll memorise the cash builder score, the offers and – occasionally – the answer to a one question decider. Days later, she’ll then say “do you remember when…?”and I can’t, but she can! It’s good that she’s relaxed, that she’s not thinking ahead to next week and all the changes that my operation will bring. It’s a relief.